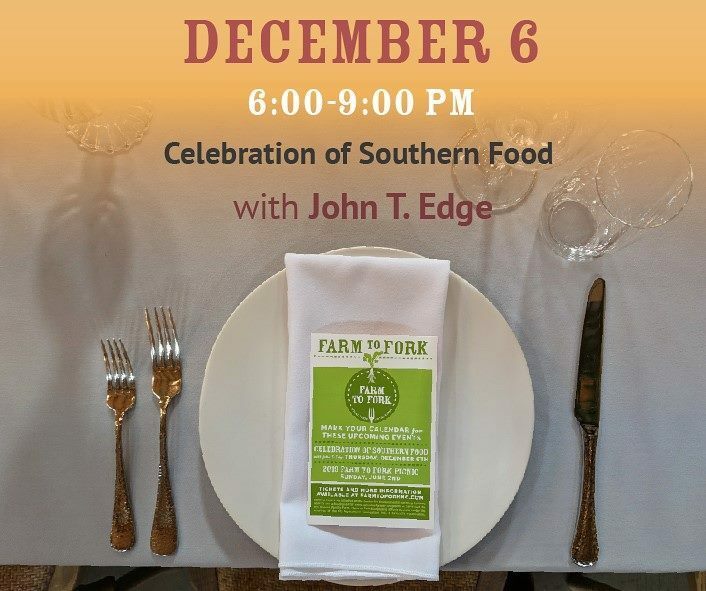 Farm to Fork presents this final event of the series -- "Celebration of Southern Food" -- amid the fragrant setting of Lavender Oaks Farm in Chapel Hill with guest speaker John T. Edge, author of critically acclaimed The Potlikker Papers: A Food History of the Modern South. A prolific writer and insightful social commentator, Edge is director of the influential Southern Foodways Alliance. This celebration of Southern food will be a sort of moveable feast, with dishes prepared by 8 prominent area chefs at different stations. Participants include: Sean Fowler of Mandolin in Raleigh; Cheetie Kumar of Garland in Raleigh; Brendan Cox of Oakleaf in Carrboro; Wyatt Dickson of Picnic in Durham; Ricky Moore of Saltbox in Durham; Robert Kinneen of The Boot in Durham; Alexander Kast of Uli's Raclette; Jonathan Fisher and Phoebe Lawless. Beverage sponsors include Carrboro Coffee Roasters, Fullsteam Brewery, Haw River Wine Man, TOPO Organic Spirits and Honeygirl Meadery. Live music by the Counter Clockwise Band.